Henry Kern, Sr., was the oldest son of John Yost Kern and his wife, Eva Maria Weiss. He was born in Germany on November 17, 1769. He came to America with his parents apparently two years later. The records aren't exactly clear when they immigrated, but 1771 has the most credence. The family settled on farmland near Beavertown, Pennsylvania. In the fall of 1821, Henry arrived back in Germany with the intent of bringing back to America his Aunt Elizabeth Miller. For some reason she was not ready to go, so Henry returned to America without her. In 1823, he made his second trip and by this time his aunt had converted all her estate into money and was ready to go. Her money was exchanged for bibles, testaments, and clocks by Henry. At that time there were no foreign exchange facilities. The clocks were manufactured at Black Forest (Schwarzwalk), Switzerland. At the appointed time, Henry went to get his clocks. He was told that they were not finished, so he had to wait. He was invited to board with the proprietor, who wined and dined him at every meal. After Henry returned to the America with his Aunt, the articles were sold and the family realized a substantial amount of wealth. 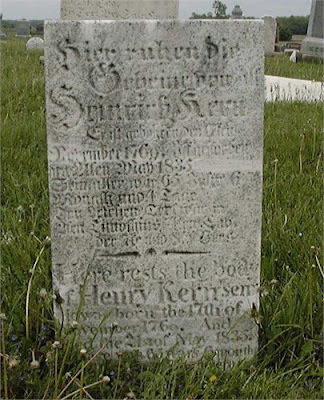 Henry's brothers, Peter and Jacob Kern, emigrated to Ohio in about 1833. In 1834, Henry made his first trip to Seneca and Huron Counties in Ohio to see them. He walked the 450 miles from his home in near Beavertown, Pennsylvania. While there he bought some government land for $1.25 an acre. He then walked the 450 miles back home to Pennsylvania. In 1835, Henry again walked the 450 miles to see his brothers and his land. A few weeks after his arrival, he was taken sick and died on March 21, 1835, at the home of his brother, Peter, in Seneca County. He was buried at the Zion Reformed Church Cemetery in Seneca County.